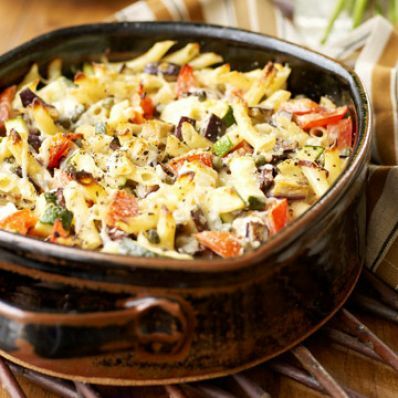 This vegetable and pasta casserole dish includes penne pasta tossed with summer vegetables--eggplant, zucchini, and tomatoes--and a tart goat cheese sauce. 1 of 3 Heat oven to 350 degrees F. Coat a 3-quart baking dish with nonstick cooking spray. Cook penne following package directions; drain and transfer to a large bowl. 2 of 3 While pasta cooks, heat oil in a large nonstick skillet over medium-high heat. Add eggplant, zucchini, onion and garlic, and cook, stirring often, 10 minutes or until vegetables are crisp-tender. Add vegetable mixture to cooked pasta. In a large bowl, combine tomatoes, olives, capers, thyme, salt, and pepper. In a small bowl, whisk goat cheese and milk until combined; add to tomato mixture, then toss this mixture with pasta. 3 of 3 Transfer to prepared baking dish. Sprinkle with Parmesan and cover with foil. Bake at 350 degrees F for 15 minutes. Remove foil and bake an additional 15 minutes or until heated through. Per Serving: 46 g carb., 14 g pro., 12 g Fat, total, 5 g sat. fat, 56 mg chol., 673 mg sodium, 359 kcal cal.